Michelangelo Antonioni's L'Avventura is considered to be one of the greatest films ever made by many film scholars and historians. I suspect that the film may have been groundbreaking in its day, but the film, when viewed today isn't as fascinating. I may need to rewatch the film, as I was very tired when I saw it last night, but I really did not get much out of watching the film other than some beautiful cinematography and music, and some really wonderful scenes. This was 143 minutes that felt like an eternity. Thanks to Film Forum, one of the best theaters in New York City, I was able to see the film restored and presented in 35 mm. There is something beautiful and comforting about 35 mm. The imperfections of the image show and everything has a silvery, smooth feel to it, unlike digital images which have pixels and look too perfect. Maybe I feel this way because I grew up with 35 mm projection, but I just thought that it looked fantastic and complemented the beautiful shot composition perfectly. My one issue with this print is that the subtitles are very hard to read, as they are white on a black-and-white film. If anything, L'Avventura is gorgeously shot. Each shot is immaculately composed and framed. The camera doesn't move very much allowing the viewer to savor each image. Antonioni did an excellent job at making me feel the desolation of everything in the film. The landscapes are desolate, as are the people's emotions. Desolation and emotional isolation are very interesting themes, but Antonioni takes far too long to develop anything. I know the point of the film is to be unfocused and Antonioni wanted to let the story meander, but it meanders too much. Antonioni does pull some clever narrative tricks in L'Avventura, but his storyline is too unfocused to make them have any real impact. The film is far too long at 143 minutes. 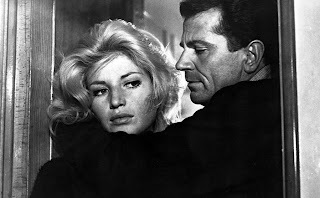 Overall, L'Avventura is an interesting film marred by its meandering story and overlong running time. I will, however, definitely give the film another chance some time soon, as I was intrigued enough by it that I'd like to see it again and study it.